The world of psychiatry can seem a confusing place to those of us not medically trained. The terminology can be complex, the medication a mystery and the DSM-V (Diagnostic and Statistical Manual of Mental Disorders) a daunting read. Many of us, however, as counsellors and friends, are regularly called to engage with those who have received diagnoses – and their families and friends as well. They ask our opinion, they seek our support. We need help to navigate such conversations wisely if we are to honour the Lord and serve our brothers and sisters well. In his short, accessible, book Mike Emlet helps those of us who are new to psychiatric matters do just that. Written from an “assume nothing” stance, his words walk us through the basics of how diagnoses are made and how common prescription drugs generally work. Ever wondered what the placebo effect might be? A simple answer is found within these pages. Want to know what a neurotransmitter is? An introductory steer is only a short read away. Careful to avoid the dual dangers of being too warm to psychiatry or too cold, its bite-sized chapters enable non-specialists to celebrate the good the discipline brings while simultaneously retaining absolute confidence in God and His Word. How wonderful it is to be able to learn from psychiatry’s long tradition of describing the symptoms and experience of mental illness well. How much we have to learn about the role of the body in people’s distress. How wise it is to be watchful for the signs of danger in people’s lives that psychiatrists often spot far more quickly than we. How important it is to remember the limitations of a medical discipline which acknowledges nothing of a sovereign God, a merciful Saviour, a Spirit-filled life or eternal hope. It’s a book that is packed full of practical wisdom, helping us pose insightful questions to those we meet. It simultaneously encourages us to liaise with medics and be active in addressing the struggles of people’s heart through a Scriptural lens. Are our brothers and sisters seeing their prescription as a God-given gift or an idol that will fix them, with no further reflection required? Are our friends eager to turn to the Lord in the depths of their struggle or keen to use it as an excuse to turn away? Do those we counsel see wellness as their highest goal or conformity to the image of Christ? Are we able to frame suffering in a biblical light – neither minimising its pain nor portraying it as a pointless waste? Available in the UK in a few weeks’ time, this little gem is likely to become a must-read on many a biblical counsellor’s shelf. So, why not get equipped for the conversations to come? Get ready to serve those with psychiatric diagnoses with wisdom and care. 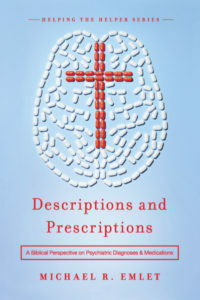 Descriptions and Prescriptions by Michael Emlet is available now to pre-order from 10ofthose.